Recently, traditional fluoroscopy used in catheterization labs has been augmented by advanced imaging techniques including three-dimensional (3D) rotational angiography, computed tomography (CT), and magnetic resonance imaging (MRI). These datasets can be fused onto real-time fluoroscopy imaging to help guide complex interventions and improve visualization of structures not well seen by standard fluoroscopic techniques. In recent years, this technology has been applied across many types of cardiac interventions. We describe a unique use of MRI overlay to assist with transhepatic vascular access in a patient with multiple venous occlusions, extensive venous collateralization, and complex abdominal anatomy. This technique was utilized both to avoid a large hepatic mass and to directly access a hepatic vein. A 12-year-old, 32.8 kg boy, with a complex medical history, including prune belly syndrome and obstructive uropathy status post two renal transplants, was referred to the catheterization lab due to superior vena cava (SVC) stenosis. His history of multiple indwelling lines resulted in diffuse venous thromboses including occlusion of the SVC, innominate vein, right and left subclavian veins, right and left internal jugular veins, infrarenal inferior vena cava, and the common iliac and femoral veins. He had an increasing mean SVC gradient to 23 mmHg accompanied by worsening signs and symptoms of SVC syndrome. Given these findings, the patient was referred for cardiac catheterization with possible SVC stent placement. Contrast enhanced 3D magnetic resonance angiography (MRA) was performed the day prior to catheterization. The MRA demonstrated an occluded proximal SVC [Figure 1]. There were extensive collateral vessels in the chest wall, mediastinum, and paravertebral regions with dilated and tortuous azygous and hemiazygous systems and an enlarged left superior intercostal vein [Figure 2]. In addition, on contrast-enhanced images, there was a large area of high signal intensity in the liver near the falciform ligament, representing hepatic venous congestion or a vascular mass. On coronal projection, the mass was located at the level of the projected transhepatic access site, and therefore, overlay of the 3-D MRI images onto live fluoroscopy was utilized to visualize the mass in relation to the access site. Post-processing of the venous phase of the 3D MRA was performed and the image then registered to live fluoroscopy using a commercially available multimodality workstation (Leonardo with InSpace 3D software; Siemens Medical Solutions, Germany). 3D MRA images were registered to the fluoroscopic image by using bony and airway landmarks, and image fusion with live fluoroscopy was performed using the Syngo iPilot software (Siemens Medical Solutions, Germany). With the MRI image in place, fluoroscopy was performed at right anterior oblique (RAO)-90 and showed the enhancing liver mass to be well anterior to the projected course of transhepatic access [Figure 3]. After confirming this position, we proceeded with transhepatic access by the usual technique using a 22 gauge × 15 cm Chiba needle (Cook Medical Inc, Bloomington, IN) without success. The available MRA overlay was therefore reprocessed to visualize the hepatic veins and used as a roadmap to successfully access the right hepatic vein [Figure 3]. With venous access established, we proceeded with angioplasty and stenting of the SVC. Mean azygous vein pressure was 27 mmHg. By angiography, the azygous vein measured 10.4 mm, narrowing to 6 mm just prior to entering the SVC, which measured 5.1 × 4.9 mm. An iCast 10 mm × 38 mm stent (Atrium Medical Corporation, Hudson, NH) was then placed across the SVC and into the proximal azygous vein and subsequently post-dilated with high-pressure angioplasty with complete resolution of balloon waist. Repeat angiogram showed marked improvement in SVC caliber and unobstructed flow from azygous vein into the SVC. Mean pressure in the azygous vein decreased to 18 mmHg with a residual mean gradient of 7-8 mmHg across the SVC stent. At 1-month follow-up, there was marked decrease in neck and head size, decrease in size and prominence of superficial veins on his neck and abdomen, and subjective improvement in exercise tolerance. There were no adverse events associated with transhepatic access. Since the first description of transhepatic cardiac catheterization in children in 1995,  it has become an important route of vascular access in patients with limited venous access. It is traditionally performed using landmarks and fluoroscopic guidance, and can be performed with high rates of success and low incidence of complications. ,, Transhepatic access under ultrasound guidance may be particularly useful in patients with complex abdominal anatomy, and may further decrease the low risk of procedural complications. 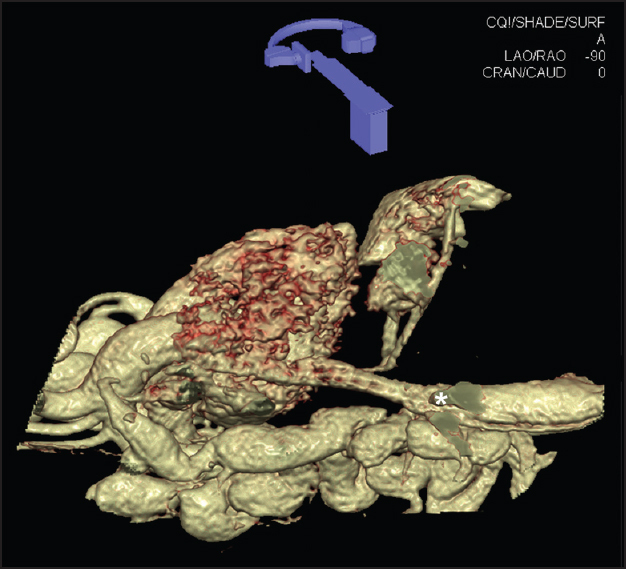 We describe an adjunctive use of multimodality 3D image overlay to assist with difficult transhepatic access. The use of 3D image guidance has found greatest use in interventional neuroradiology. , This technique, however, has been used increasingly in cardiac procedures including in electrophysiology labs for mapping prior to catheter ablation  and for cardiac interventions in children with congenital heart disease. ,, This type of 3D road mapping has the potential to decrease procedural times and fluoroscopy dose, and as in this case, may improve visualization and procedural comfort with complex anatomy. Continued evaluation of this methodology will therefore be important to the future of interventional catheterization. The complex abdominal and central venous anatomy of the described case increased the difficulty of standard transhepatic access techniques and the anterior vascular hepatic mass would have made ultrasound guidance difficult. While recannulation of occluded vessels could have been considered for access to the central venous anatomy, utilizing MRI overlay we were better able to understand the relationship between the vascular mass and the hepatic veins, which increased our confidence in the ability to safely perform transhepatic access. Use of MRI overlay on real-time fluoroscopy can be a useful adjunct to traditional techniques in cases with difficult or complex anatomy. The additional anatomic information provided by the overlay image may prove useful in improving safety and expediting procedures in the cardiac catheterization lab. 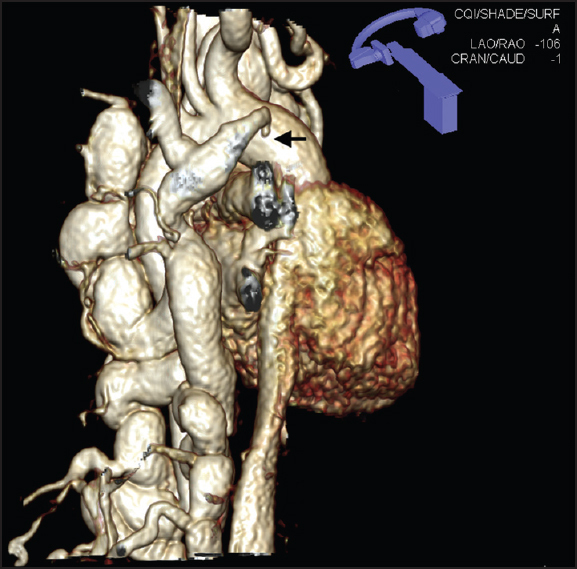 The authors would like to thank Dr. Jimmy Lu for performing the cardiac MRI used for this case as well as Dr. Aimee Armstrong for her assistance with Leonardo and the 3D InSpace software. Shim D, Lloyd TR, Cho KJ, Moorehead CP, Beekman RH 3 rd . Transhepatic cardiac catheterization in children. Evaluation of efficacy and safety. Circulation 1995;92:1526-30. Ebeid MR. Transhepatic vascular access for diagnostic and interventional procedures: Techniques, outcome, and complications. Catheter Cardiovasc Interv 2007;69:594-606. Shim D, Lloyd TR, Beekman RH 3rd. Transhepatic therapeutic cardiac catheterization: A new option for the pediatric interventionalist. Catheter Cardiovasc Interv 1999;47:41-5. Johnston TA, Donnelly LF, Frush DP, O'Laughlin MP. Transhepatic catheterization using ultrasound-guided access. Pediatr Cardiol 2003;24:393-6. Söderman M, Babic D, Homan R, Andersson T. 3D roadmap in neuroangiography: Technique and clinical interest. Neuroradiology 2005;47:735-40. Bakker, den Heeten, van Rooij, Grimbergen. Image guidance for neurovascular intervention: Proposed setup for a 3D-roadmap system. Minim Invasive Ther Allied Technol 2003;12:304-9. Ector J, De Buck S, Adams J, Dymarkowski S, Bogaert J, Maes F, et al. Cardiac three-dimensional magnetic resonance imaging and fluoroscopy merging: A new approach for electroanatomic mapping to assist catheter ablation. Circulation 2005;112:3769-76. 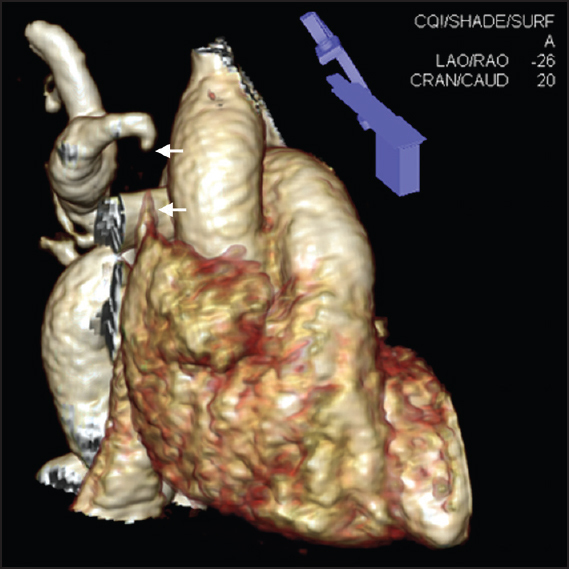 Glöckler M, Halbfaβ J, Koch A, Achenbach S, Dittrich S. Multimodality 3D-roadmap for cardiovascular interventions in congenital heart disease - a single-center, retrospective analysis of 78 cases. Catheter Cardiovasc Interv 2013;82:436-42. Gutiérrez LF, Silva Rd, Ozturk C, Sonmez M, Stine AM, Raval AN, et al. Technology preview: X-ray fused with magnetic resonance during invasive cardiovascular procedures. Catheter Cardiovasc Interv 2007;70:773-82. Dori Y, Sarmiento M, Glatz AC, Gillespie MJ, Jones VM, Harris MA, et al. X-ray magnetic resonance fusion to internal markers and utility in congenital heart disease catheterization. Circ Cardiovasc Imaging 2011;4:415-24.